As many of you know (and if you don't, you can read my feelings here), I have long been frustrated with the perception that we in the military suffer from political groupthink. I have been equally frustrated that many actually do seem to suffer from that affliction. And I have been most frustrated by the fact that many in the Republican party claim to be the best representation of service members and veterans, while they simultaneously continue to cut benefits, redefine combat injuries (to exclude roadside bombs and landmines!) and refuse to grant benefits to treat post-traumatic stress disorder, more often than not calling it a prior condition. And these are the people who are supposed to be the party of the military? Give me a break. So, if these things don't make you angry enough, let me remind you of General Eric Shinseki, who was fired by President Bush and ridiculed by Secretary Rumsfeld after telling Congress in 2003 that it would take "on the order of several hundred thousand soldiers," to occupy Iraq, because "we're talking about post-hostilities control over a piece of geography that's fairly significant with the kinds of ethnic tensions that could lead to other problems." Does this sound like a wise prediction to anyone else? Maybe that's because that is exactly the situation we have found ourselves in. The man made a measured, analytical, well-informed decision, and was then rewarded for his candor by losing his job. Well, guess what dear readers... our President-Elect has remedied the situation by appointing General Shinseki as the Secretary of Veterans' Affairs. Or I should say he has begun to remedy the situation. This particular situation will take a while to remedy. 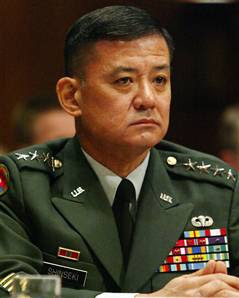 One of General Shinseki's first orders of business will be to re-redefined "combat injuries" to include COMBAT INJURIES like roadside bombs and landmines. The absolute ludicrous nature of the fact that somehow such injuries could be excluded (and thereby denied benefits) astounds me. Even worse are those who have been told they had a case of pre-existing depression or paranoia and thus cannot be treated for PTSD. PTSD is terrifying not just for the afflicted warrior but also, and I might say especially, for the friends and family of that person. Imagine having your husband return home after six months, a year, fifteen months if he's Army, and not knowing him anymore. Seeing him twitch at loud noises. Watching him lay awake at night and ultimately just give up on trying to sleep. Maybe even reaching for a weapon or resorting to violence at the slightest provocation. I'm not making these things up, they are classic symptoms of PTSD and I have seen them firsthand. Now imagine the VA telling you that you'll just have to deal with your husband's newfound craziness (at personal risk to you, I might add), because he probably just had a pre-existing condition. This makes me absolutely sick. With Shinseki at the helm, my deepest hope is that these labeling errors will be resolved, resulting in the best care we can possibly provide to our military members and families. Arianna Huffington has an excellent post on the topic of General Shinseki's appointment in which she discusses Obama's propensity for rewarding those who "got it right," (Shinseki) rather than promoting and rewarding those who got it wrong (Rumsfeld, Brown of FEMA, etc). Here's to 8 years of getting it right.